Sunair is one of those interesting airlines that ply our skies but despite being around for over 30 years not many people know about it. Despite this it has found its niche and continues to not only survive but to shine where so many others have failed. Sunair Aviation Ltd was established in by Dan Power and his wife Bev in 1985. Two years later they applied to the Civil Aviation Authority for an air operator's certificate and commenced charter operations. 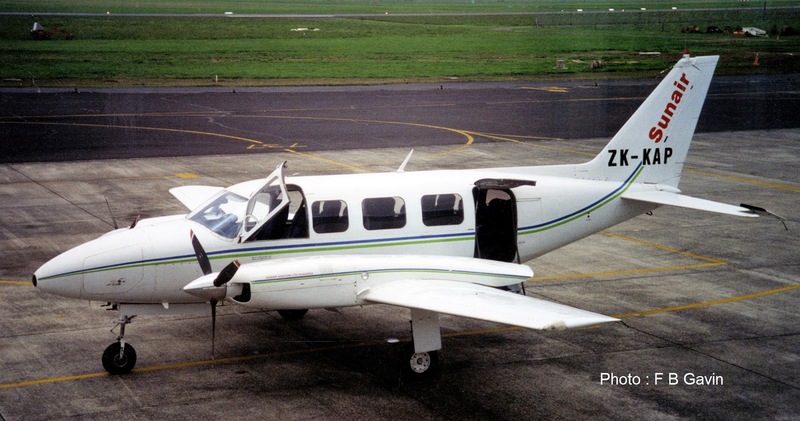 In late 1988 Sunair started a Tauranga-Auckland service using Cessna 402B Utililiner ZK-EHS. The following year, however, when Eagle Air replaced Air New Zealand Friendship services between Tauranga and Auckland, Sunair dropped its timetable services over the same route. About the same time, by November 1988 Sunair was operating a summer service from Tauranga to Great Barrier Island. This summer schedule continued for a number of years before being restarted in 2009. In March 1990 Sunair purchased Island Air Safaris and their Cessna P206 Super Skylane ZK-DRD and took over their flights from Tauranga to Motiti Island. The operation was later sold to Island Air Services, which lasted a year or so, before it was on sold to Island Air Charter. In addition the early fleet included Cessna 172N ZK-ELG, Cessna U206F Stationair, ZK-DFW and Piper Pa32-260 Cherokee 6 ZK-DEF. Cessna 172 ZK-ELG at Tauranga on 26 November 1996. In 1999 Sunair introduced two Partenavia P68Bs to their fleet, ZK-LGO and ZK-ZSP. The Partenavias did not last long in the fleet and were sold in mid 2002. Instead Sunair focused on Piper Pa23 Aztecs. Over the years Sunair has operated eleven of them; ZK-DGS, ZK-DIR, ZK-ECM, ZK-ERM, ZK-EVP, ZK-FHO, ZK-FVP, ZK-MTY, ZK-PIW, ZK-PIX, ZK-TDM and ZK-WDP which is the only aircraft not to wear titles. Of these only ZK-FHO has been retired from the fleet. ZK-WDP is currently on charter in Kiribati. In addition to these Sunair also operated Piper Pa31-350 Chieftain ZK-KAP between July 2003 and January 2004 and Cessna 421C Golden Eagle ZK-WLG was purchased in 1999. It was used on Sunair services and for charter work and was eventually sold in 2008 but it had not been used for some time before that. Other light aircraft used included Cessna 152 II ZK-ETY which was used from late 1992 to late 1994 and Cessna 172 ZK-ELG. These were used for pilot training. ZK-SAL Cessna 172N was part of the fleet from August 1993 until December 1994. In its last month of service with Sunair it was reregistered as ZK-KAS. Piper Pa-34-200 Seneca ZK-DCL was registered to Sunair for six months while Piper Pa-31-310 Navajo ZK-WHW was registered to the company for two months in the same year. The Cessna 421 Golden Eagle, ZK-WLG taken at Tauranga on the 23rd of January 2002. Piper Chieftain ZK-KAP taken at Hamilton on the 6th of June 2003. In 2002 Sunair picked up Air Freight’s East Coast courier service. This involved a specially dedicated freighter Aztec leaving Palmerston North at 5.30am and flying through Wairoa to Gisborne. In the evening the southbound flight also called at Napier from whence the flight flew to Paraparaumu stopping at Palmerston North if there were passengers. Wairoa never appeared on Sunair’s published timetable and the stops there were for courier freight only. 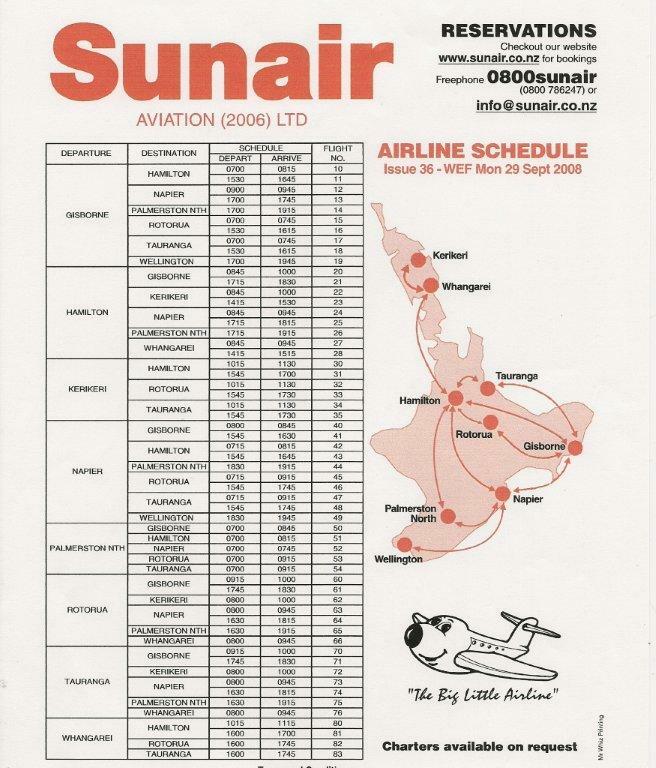 From the 30th of September 2002 Sunair began operating a Tauranga-Hamilton service on behalf of Origin Pacific to link with other flights over Origin’s network. In 2003 the company offered a New Plymouth-Palmerston North extension to their flights to New Plymouth from Hamilton. The service was not successful and it was withdrawn from the 31st of May 2004 timetable. In 2005 the freight flight south from Gisborne and Napier was extended to Wellington and this continued to be in the schedule until September 2007. 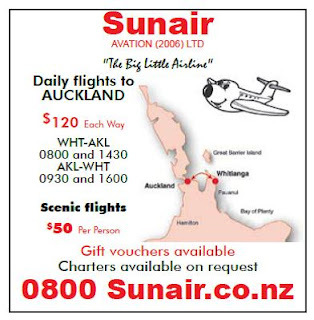 From the 30th of August 2004 the company introduced Whangarei-Hamilton flights which connected with other Sunair flights from Hamilton to Rotorua, Gisborne, Napier and New Plymouth. The service never really took off and was relaunched a number of times. 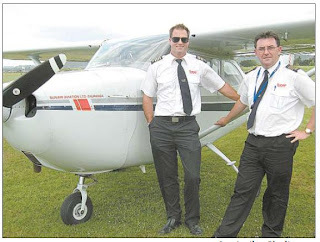 Quantum Aviation, a Whangarei based flight school were appointed as the agents. Quantum students were already doing some training with Sunair in Tauranga and the connection opened up opportunities for advanced training and future employment. 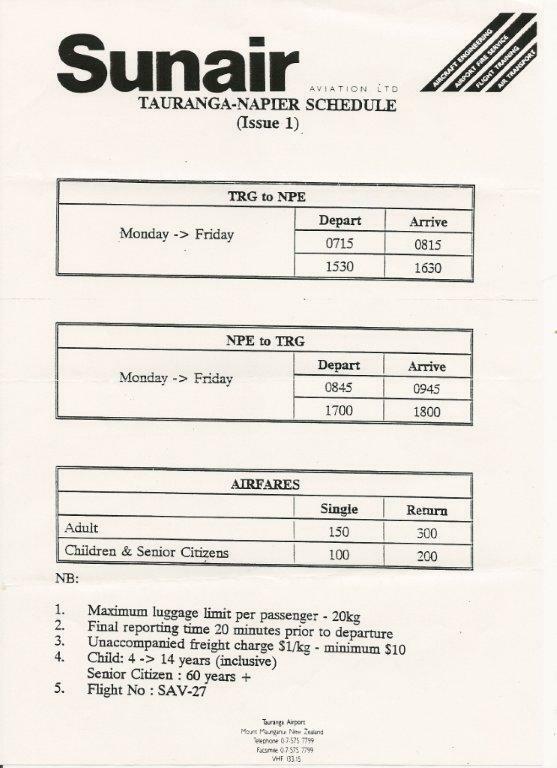 The flights were extended to include Kerikeri in September 2007 but according to the company timetable these flights to Northland were dropped from the 2nd of March 2009. In February 2008, the Navajo ZK-FIL was involved in an incident at Hawera and was withdrawn from the fleet. In September 2008 the company changed its services from Palmerston North after losing the dedicated freight flight contract from Palmerston North to Napier, Wairoa and Gisborne. Flights were scheduled to leave Palmerston North at a more civilised hour of 7.00 am instead of the previous 5.00 am but there seemed to be little demand and the timetable shows Palmerston North was subsequently dropped from the 5th of April 2010. In March 2009 Sunair announced that it would include Whakatane as a stopover on its flights between Gisborne/Napier and Hamilton/Rotorua/Tauranga. 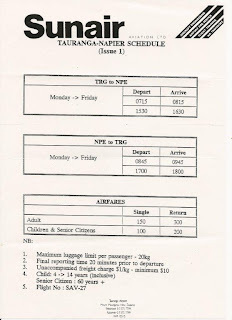 The demand was not there, however, and the Whakatane was not listed in the timetable effective the 5th of April 2010. On the 14th of December 2009 Sunair introduced daily flights between Whitianga and Auckland after a 10-year absence of any operator on the route. The company announced two flights would be offered seven days a week using either Cessna 172 or Piper Aztec aircraft. The company also offered flights between Whitianga and Great Barrier Island. Cessna 172s ZK-DHN and ZK-DKK were purchased to use on these and other Sunair routes. The Cessna 172s have also been used on other company routes and were later been joined by Cessna 172s ZK-CBZ and ZK-TAB, the latter being used to conduct flying training for the Tauranga Aero Club and an on-demand service to Motiti Island. In October 2010 Whitianga was offered as a stopover on flights from Hamilton to Rotorua, Napier and Gisborne though this option has now been removed with instead flights operated from Tauranga to Whitianga and Great Barrier Island. The crew and aircraft of the first Whitianga Auckland flight, Sunair pilots Charlie Chilwell (left) and Kevin Lloyd (right) with Cessna 172 ZK-DHN. Peninsula Post 17 December 2009. Paraparaumu was offered as a passenger destination from the 5th of April 2010 in conjunction with the courier service from Napier to Paraparaumu. Courier items from Gisborne and Wairoa were flown to Napier by Air Napier where they are transferred to the Sunair flight to Paraparaumu. 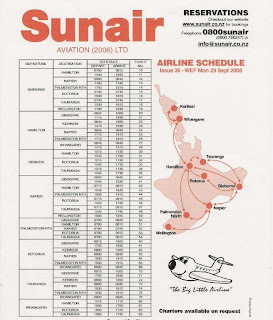 From 4 June 2012 Sunair expanded their freight flights to and from Paraparaumu by offering twice daily passenger flights to and from Napier and Gisborne, the southbound evening service being the courier flight with limited passenger accommodation. However, within the next four weeks the NZ Couriers changed its destination for its freight flights from Paraparaumu to Hamilton and from 2 July 2012 all services to Paraparaumu were deleted. In early 2013 the Hamilton-New Plymouth route was reinstated following a request from the Taranaki District Health Board to include New Plymouth. The Health Board sought the reintroduction of the air service to transfer patients who needed non-emergency medical treatment as well as medical professionals and support people, The New Plymouth service was not well patronised and was removed from the timetable by late 2013. Another Cessna 172, ZK-DPN, was added to the fleet in August 2014. From the 1st of December 2014 Sunair moved the Auckland terminus of its Whitianga flights from Auckland International to Ardmore Airport. 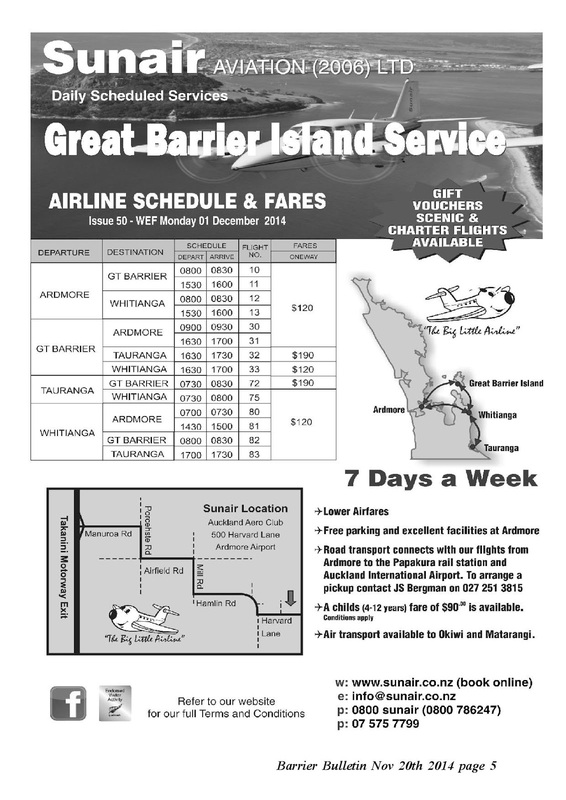 At the same Sunair introduced flights from Ardmore to Great Barrier Island as well as strengthening the Whitianga flights by removing the "two passengers required" restriction. Passengers at Ardmore are able to park for free at Sunair’s secure parking facility, while those arriving from Great Barrier Island or Whitianga who do not have vehicles can choose to either rent a car from the airport or take a $5 regular shuttle to the nearby Papakura train hub. Sunair's first flight operated on Wednesday 3 December 2014, 31 years to the day after Great Barrier Airlines’ operated their first flight between Auckland and Great Barrier Island, Sunair commenced their service from Ardmore. The first flight was operated in Cessna 172 ZK-DHN under the command of Ryan Bergman. The flight left Ardmore at 8.00am, landing at Whitianga before continuing on to the Barrier. In their first summer of operation the new services from Ardmore to Whitianga and Great Barrier Island proved very popular and from 1 May 2015 these were extended by the offering of two new services between Great Barrier Island and Hamilton and Great Barrier Island and Whangarei. On the same day Whakatane was again included on flights to and from Gisborne, Napier and Hamilton. 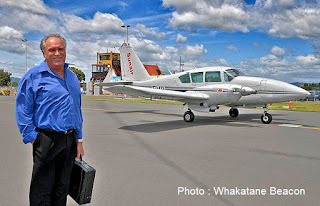 On the 22nd of May 2015 the contract to fly bank data between Gisborne and Napier on Air Napier and from Napier to Hamilton on Sunair ended marking the end of dedicated bank data courier flights in New Zealand. This freight is now carried on Air New Zealand flights. With the loss of this business Sunair then withdrew all flights to and from Napier from the 5th of October 2015 ending 19 years of Sunair operating regular air services to the Hawkes Bay. 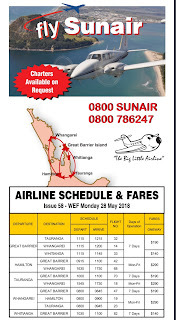 At the same time the Great Barrier-Whangarei connection was withdrawn from the Sunair timetable after failing to generate sufficient traffic. Sunair ended 2015 by announcing that it would introduce North Shore as a new destination in February 2016. 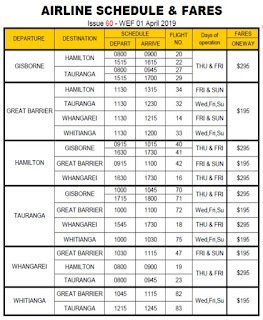 Twice daily weekday flights are planned to and from Hamilton, Tauranga and Rotorua. In preparation for this service Sunair added Piper Navajo ZK-JGA to its fleet in January 2016. The North Shore service never really took off and by August 2016 the Navajo had been sold. 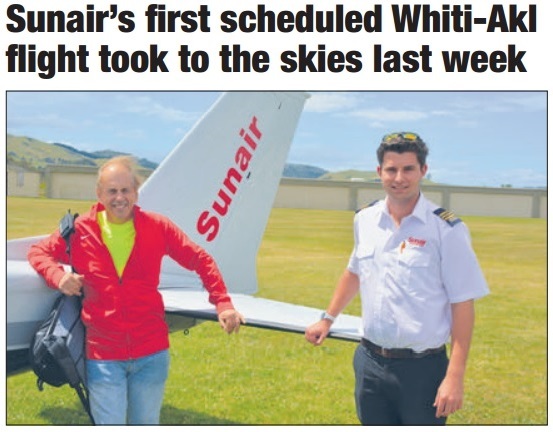 Meanwhile, in late August 2016 Barrier Air removed its Piper Chieftains from its fleet and this led to Sunair taking over the doctors flights between Whangarei and Kaitaia. Sunair experienced a brief glitch in December 2016 when the Civil Aviation Authority grounded the company. Sunair co-owner Dan Power was reported as saying that during a routine audit, the CAA became concerned the company's senior team was too small for the size of the business. “They had concerns around our management structure as not being adequate for the size and complexity of the business. I addressed that, and they're accepting of the fix.” The company resumed services within ten days. In March 2017 it was announced that Sunair Aviation had become the first regional non-jet operator in the North Island to be selected as a preferred air carrier on the All of Government panel allowing the airline has already to carry government personnel. With an Aztec based at Whangarei it seemed logical for Sunir to restart flights from Whangarei and this happened from the 3rd of April 2017 with Whangarei replacing North Shore as a destination. Flights are operated from Whangarei to Great Barrier Island, Hamilton, Tauranga or Rotorua. Sunair took over the old North Districts Aero Club building and also announced their intention to offer flight training at Whangarei. At the same time Whakatane was also withdrawn as a stopping point on the Gisborne-Hamilton service. April 2017 also saw the addition of Cessna 172 ZK-COS to its fleet. On the 8th of September 2017 Sunair Aviation was grounded by the Civil Aviation Authority for the second time in nine months with the company's Air Operator Certificate suspended along with the Certificate of Airworthiness for the Sunair fleet. While the initial grounding was for only 10 days Sunair still remained grounded for 203 days, finally being granted permission to fly again in April 2018. 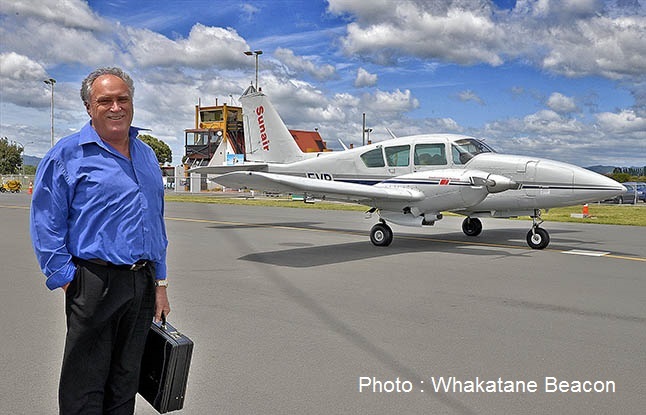 The first service resumed in its own right was the doctor service between Whangarei and Kaitaia, which Sunair had been able to continue to operate using leased aircraft. 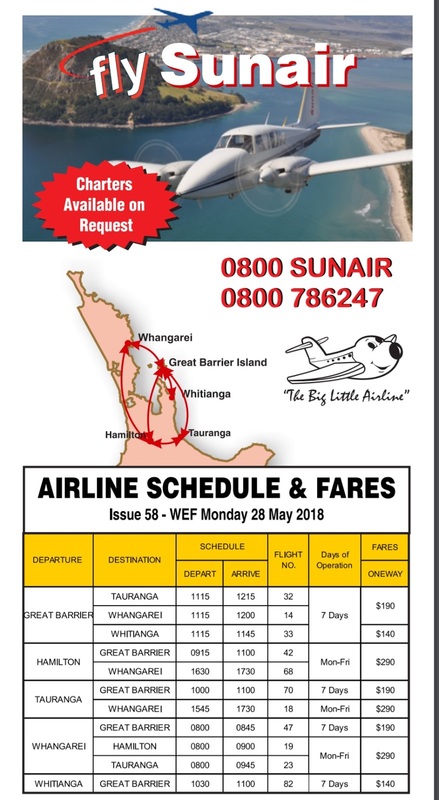 Scheduled services were offered again from the 28th of May 2018 with flights being offered from Hamilton or Tauranga to Great Barrier Island or Whangarei, and from Great Barrier Island to Whitianga or Whangarei. In November 2018 Sunair's Cessna 172, ZK-DHN was sold leaving only Cessna 172 ZK-DPN in the fleet. 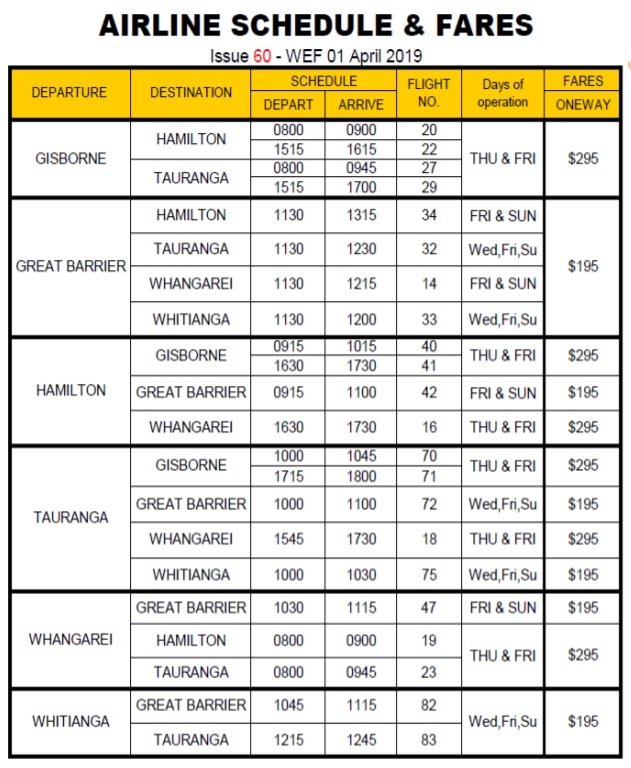 On 4 April 2019 Sunair resumed flights between Hamilton and/or Tauranga and Gisborne. The first flight was operated by Piper Aztec ZK-PIW flying from Hamilton for Gisborne on the morning service. Sunair current schedule offers twice daily return flights on Thursdays and Fridays. The 2019 winter schedule has a generally much reduced schedule with scheduled flights only operating on Wednesdays, Thursdays, Fridays and Sundays. Over the years Sunair has showed itself as an operator that has looked for a niche in the face of high fuel prices, lean routes and a national carrier that increasingly offers cheap fares. By necessity it diversified its services. Its passenger services were unique in that although there was a printed timetable the operation of the timetable was very much driven by available passengers and when they wanted to fly. Routings varied with flights stopping at various airports as needed, and in the same way timings were arranged to suit the passengers with the company seeking to provide a direct province-to-province passenger service which catered mainly for business people. Pilot training, particularly offering young pilots wanting to gain twin IFR experience as part of their flying career, was an important part of the Sunair story. Many of these have gone on to the larger carriers. Courier work was another feature of Sunair trying to find its niche and like a lot of operators it felt the effect of these courier flights being replaced by road transport. In latter year the tourist/leisure flyer market was tapped by connecting Whitianga and Great Barrier to Auckland and Tauranga. Such boutique services proved to be a winner for Sunair. Sunair also looked for opportunities not only in the air but also on the ground and the company continues to maintain an engineering workshop and it manages the handling for Air New Zealand Link at Tauranga. For a number of years until early 2015 it also operated Tauranga Airport's rescue fire service. What an amazing history, hoping for another 25 years of success, I had a quick flight as a Aid worker after the earthquake, it was an amazing experience. No longer are Sunair managing the Tauranga Airport Rescue Fire service. That contract was lost to an Ex-Employee who outbid their renewal bid and was successful. This ocured some time prior to Easter 2015. My understanding is that through less than acceptable employee treatment and the General Mickey mouse way in which Sunair ran this contract (like the rest of the business) people within became fed up, saw an opportunity and took it with both hands. March 2017, not 2016 it got the government contract? When is a Crash Landing a Crash Landing?